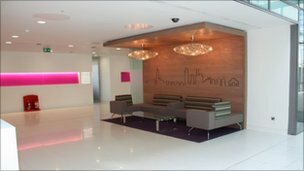 In October the BBC discovered Newham Council spent £18.7m refurbishing its new back office, called Building 1000. But documents released after a Freedom of Information request now show the total cost including purchase price and stamp duty was another £92m on top of that. During the project bosses spent almost £10,000 on five designer light fittings - at a cost of £1,853 each. 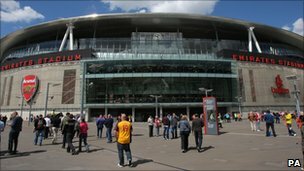 The final £111.5m cost of the building was almost a third of the cost of Arsenal's 60,000-seater Emirates Stadium. BBC research shows the £18.7m refurbishment is nearly two thirds of the money spent by every other London council combined on headquarters refurbishment over three years. Local Government Minister Bob Neill said: "Such monumental waste is scandalous. "Newham's justification that this vanity makeover was part of an efficiency drive is even more laughable now it emerges they spent nearly two thousand pounds on designer lights. "How one of the poorest boroughs in the country managed to spend £111m on their offices is beyond my comprehension." 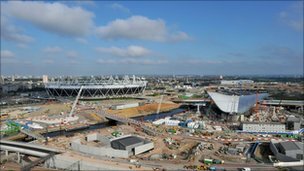 A Newham Council spokesman said: "Moving from 26 different locations to one at Newham Dockside will already have saved us £12m by next March as part of a £68m savings package over three years. "This council expects to save almost £140m in total by the end of 2014. "This move has helped to achieve the lowest council tax in outer London and there has been 0% increase for two years." Each year Newham Council receives more than £100m extra from the government than the average London council because of deprivation. Critics say the offices resemble a "West End nightclub"
But a previous BBC story showed they spent more on producing a council-run newspaper than any other London authority, at £547,000 annually. It was also revealed Newham spent more than any other council on its town festival - a greater amount than Westminster's show, which attracted five times as many people. Newham is one of the few London councils to employ a directly elected mayor, Sir Robin Wales. When he took over, the traditional town festival was rebranded as the Mayor's Newham Show and spending increased to £362,000. The council initially refused to say how much it cost before the rebranding. But the Freedom of Information request reveals spending on the show almost doubled following the mayor's decision to name it after himself, up from £158,478 in 2004. Mr Neill continued: "Clearly both Labour and Robin Wales have a lot of serious questions to answer about how they feel it is right to splash the cash when many families in the borough are struggling to make ends meet. "This is a prime example of how if councils cut out the excess and waste they can protect frontline services." Mike Law, a former councillor at the borough who has criticised its style of management, said: "Sir Robin Wales has cultivated an administration that is little more than a personal fiefdom. "His spending on follies, foibles and self-promotion is unquestioned by compliant elected members." The Newham spokesman responded: "The council holds free events like the Mayor's Show for residents and thousands attend. "The show and other events play a vital role in in bringing all parts of the community together and ensuring excellent community cohesion." The disclosures come as the government warns English councils they face average cuts in spending power of 4.4% next year. Newham faces making the deepest spending cuts of any London borough - at 8.9% - under the plans. But a Newham Council officer said that even before council funding was slashed by the government's Comprehensive Spending Review (CSR), cash shortages meant job cuts were announced. A council document lists 55 jobs, mainly working with young people, due to go. The council began consulting on the job losses on 11 October, a week before the CSR targeted local government for the harshest cuts. The roles include a teenage sexual health officer, a substance misuse manager, a drug education adviser and a host of teaching support staff. The document lists the £2.8m the council hopes to save by the move. The officer, speaking on condition of anonymity, said 49 of the 55 redundancies were expected to be confirmed. The employee said: "People just can't understand that sort of spending. "It just makes you wonder what the priorities are by the people leading this council. "I don't think it's right to spend that sort of money when jobs now have to go." The officer also told the BBC that at an emergency meeting councillors voted through the a proposal to save £19.3m by changing employees terms and conditions. Unions are currently examining the proposals. Mr Law also said he understood plans to change employees' conditions were under way. He warned the total number of job losses at the authority following the cuts could reach a total of 1,600. Mr Law said: "Had money not been spent on Building 1000, had the council not wasted £500,000 on a glossy magazine, things may have been different." The council said it could not comment on the job losses. Newham, where all 60 councillors are Labour, is ranked as the UK's sixth most deprived borough.